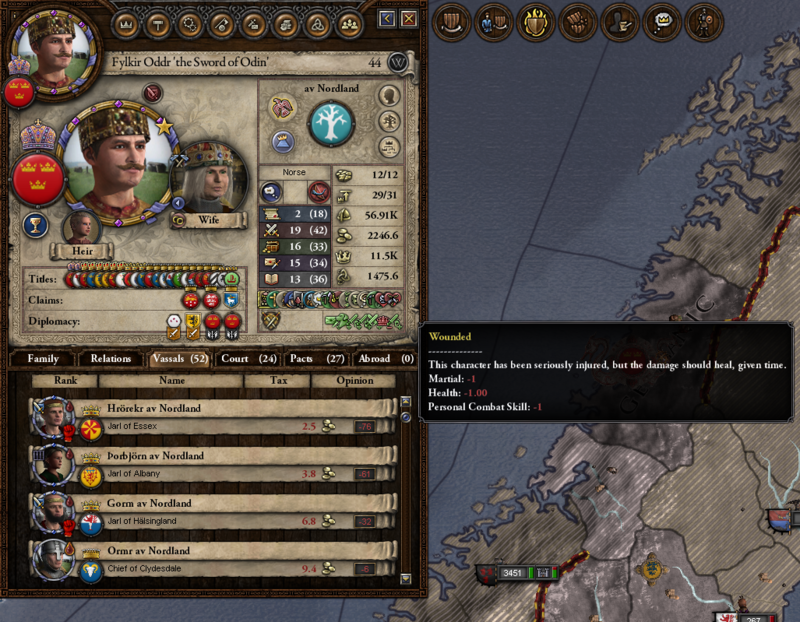 In our last installment, Emperor Oddr had apparently been driven barking mad by his time in the Varangian Guard, but that hadn’t stopped him from taking over Scotland, Ireland and Wales. 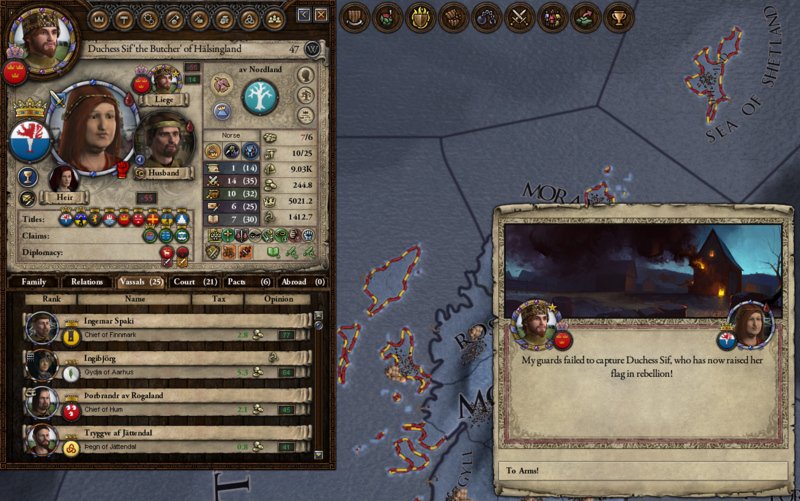 One of my Jarls has challenged me to single combat! 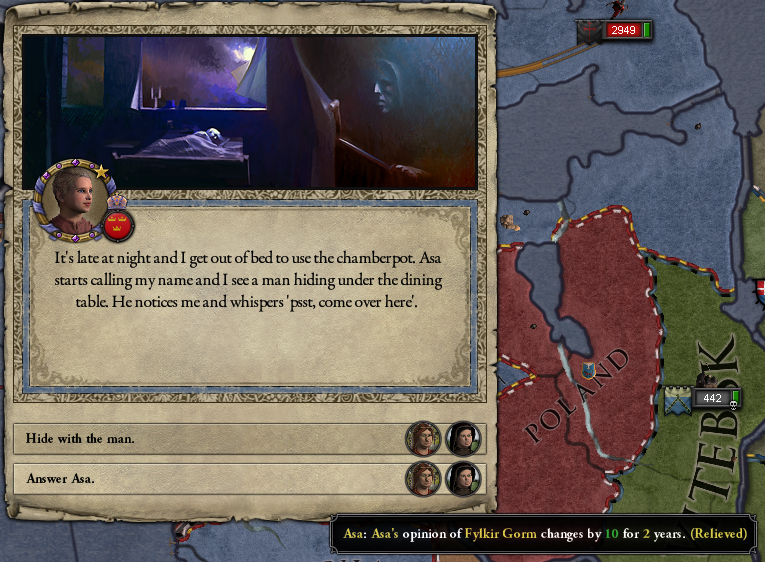 Since I took care of Cthulhu, I’m pretty I can handle him. My chances of winning are very good! 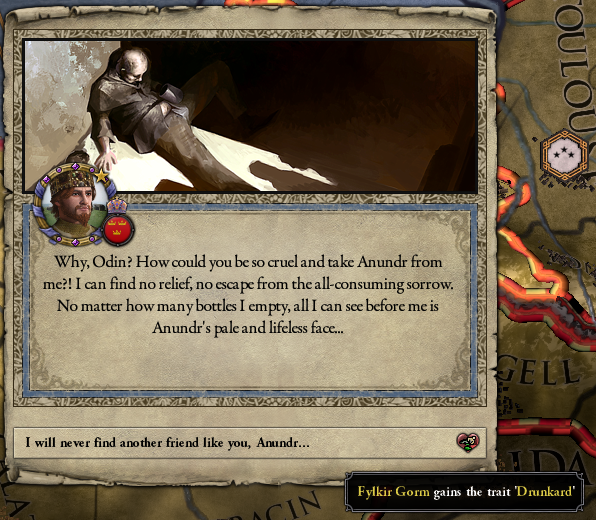 But not good enough, apparently, since I’m wounded and forced to yield. What the hell, Oddr? 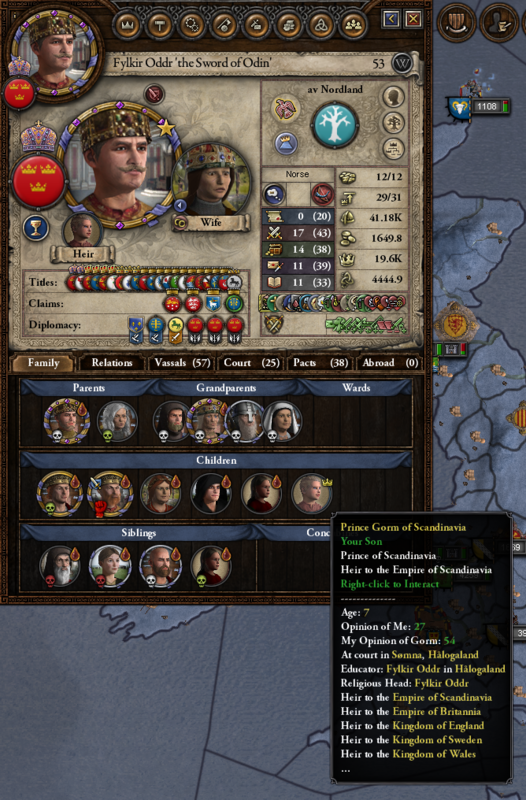 Princess Ystradwel is a pretty awesome name. 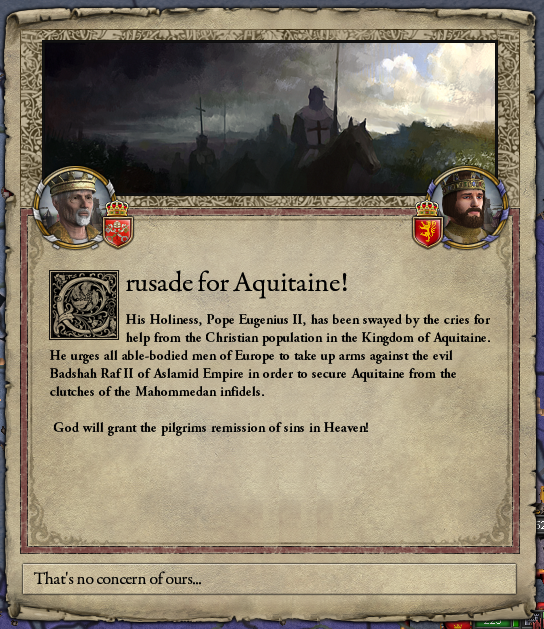 This scares me for a second, but Aquitaine is owned by the Spanish Muslims now. Have at it! 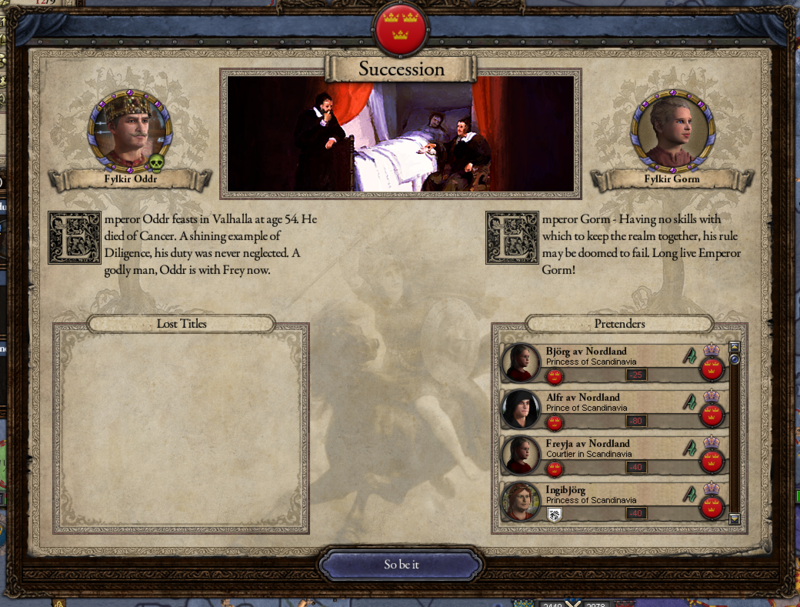 Some more vassals revolt, but I capture their leader in the first battle, so it’s over quickly. It’s Dad’s old friend Sveinn! 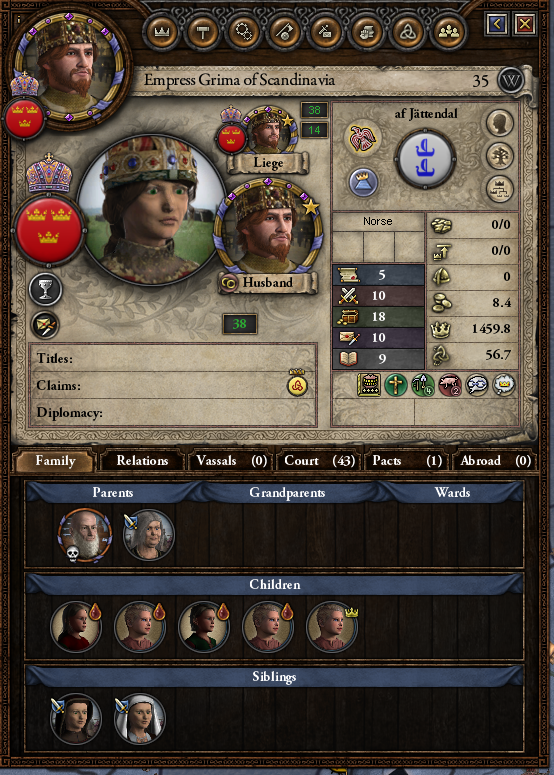 He and his buddies are Christians, so I get to take all their titles. 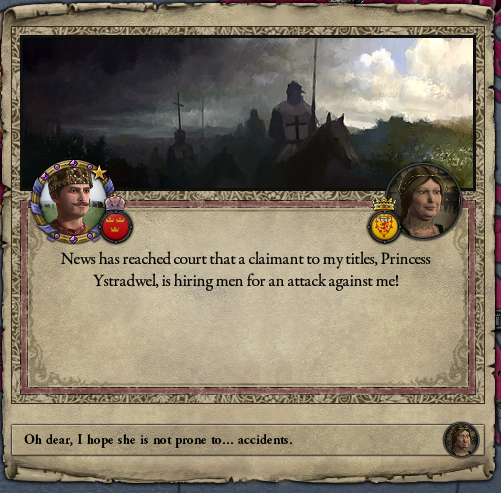 Princess Ystradwel finally shows up, in kind of an inconvenient spot. My armies sail over to meet her. 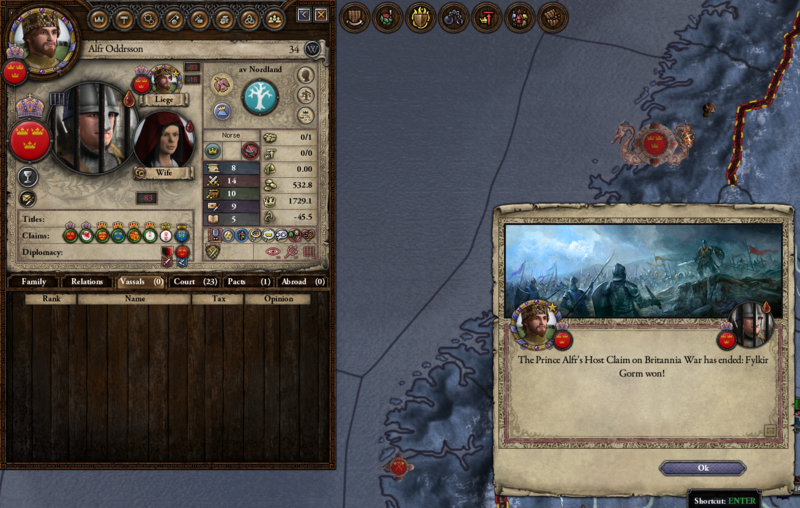 Bringing her to battle is a pain, since there are bad roads and low supplies in the east. I manage it eventually, though. Soon enough, she’s banished and her gold swells my coffers. Try again anytime! 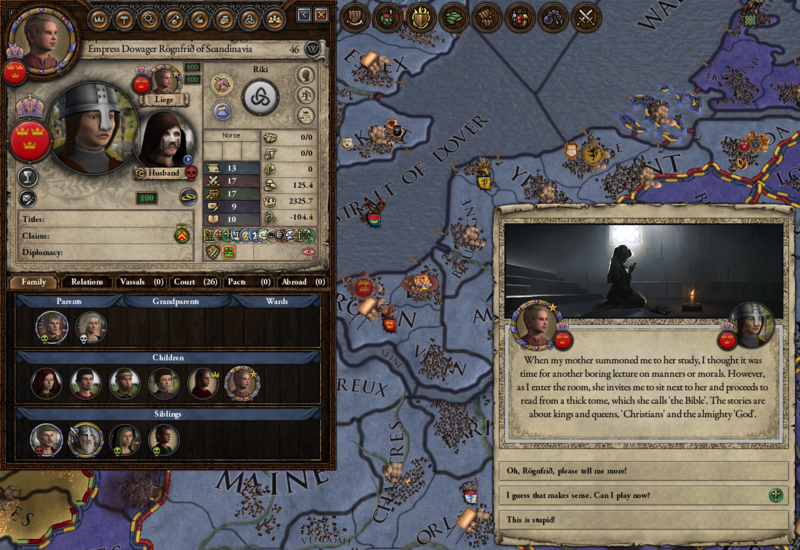 …and is accused by his daughter of murder, which he is only sort of guilty of. 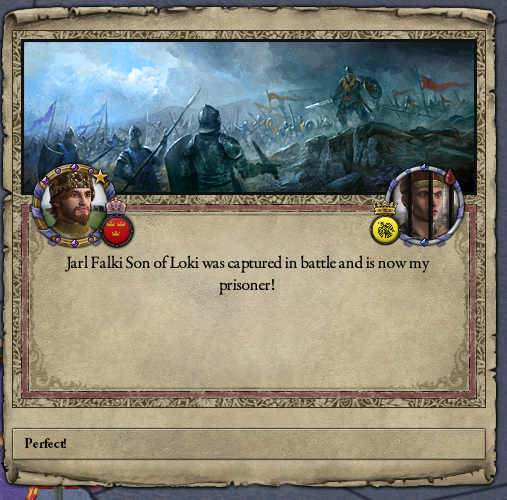 I mean, I did throw the guy in prison for life, but technically I didn’t kill him, right? 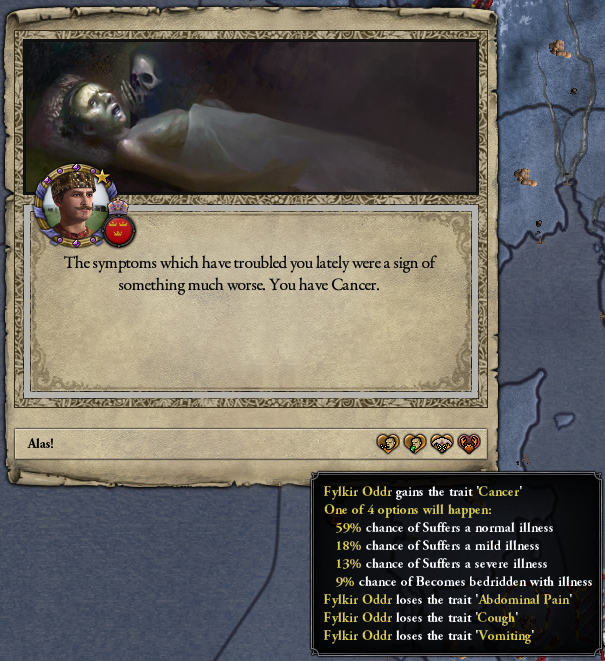 …and I have cancer. Some days, you just can’t win. 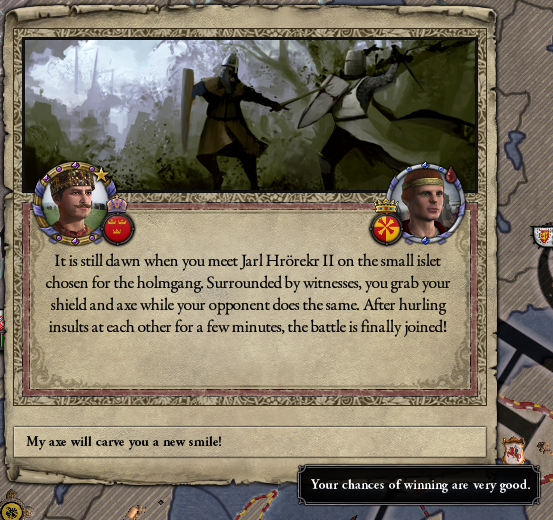 …and take care of the host army with stabbing! So that’s all right. Okay. 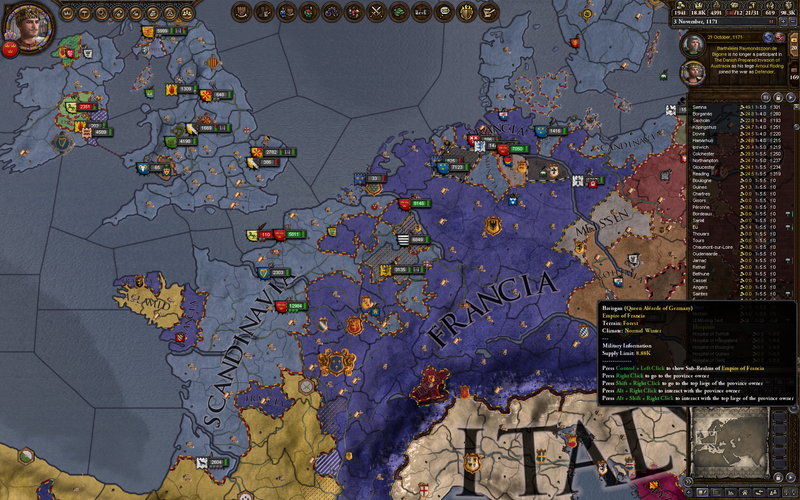 France is kind of a mess, being currently split between “France” and “Francia”, which is confusing. But it means that if I’m going to attack, now’s the time. 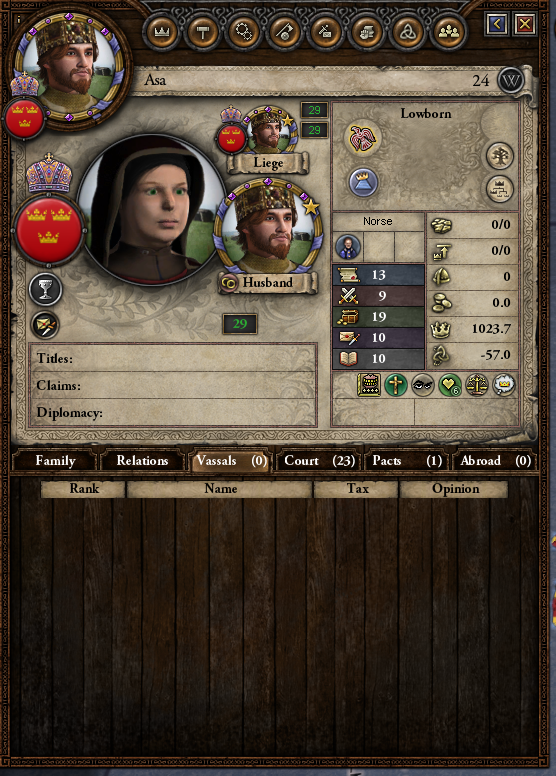 The Empress of Francia is definitely looking weak. 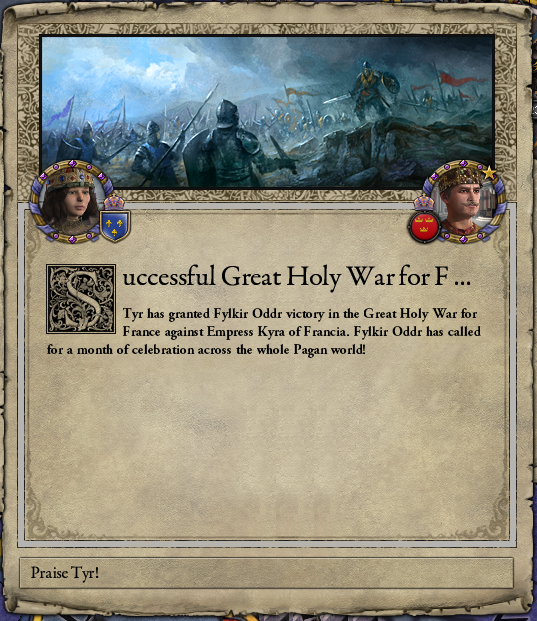 Time for a Great Holy War! 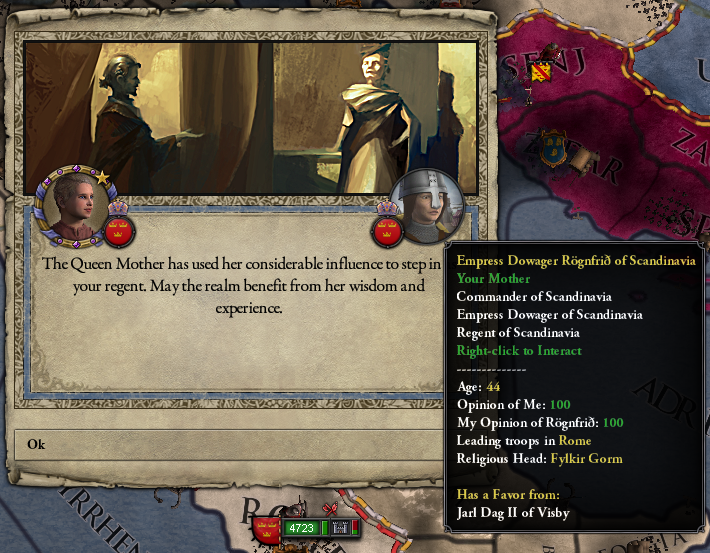 This is where the Empress turning Orthodox helps me out a lot — only other Orthodox rulers can help her, and that means basically just the Byzantines, who are too far away. The Great Holy War begins! 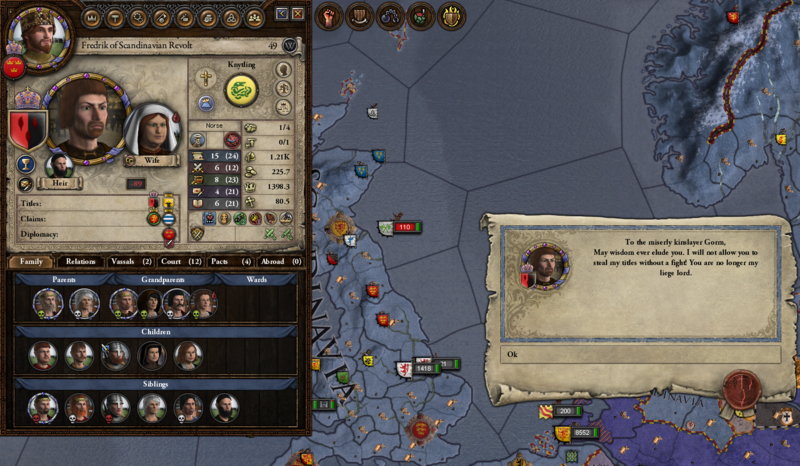 And I basically march straight to Paris with no resistance whatsoever. In fact, the French agree to surrender without even a token battle. Praise Tyr for this, um, glorious victory! However, you can’t argue with results. I’m now on the continent with a vengeance. 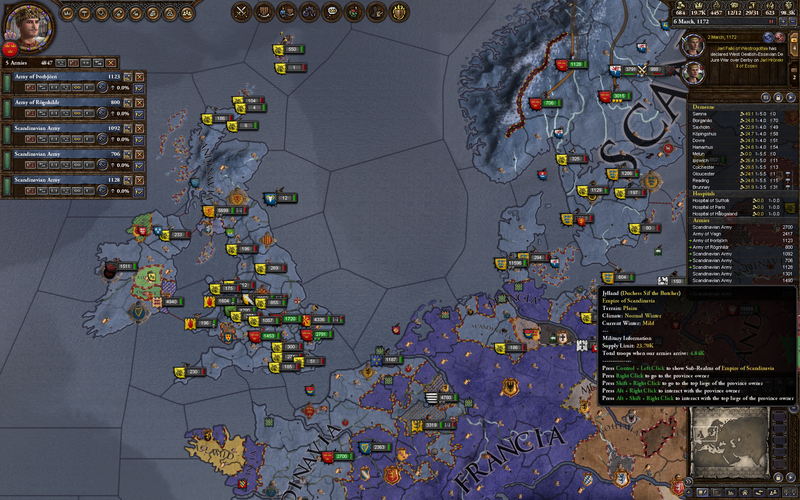 I spend some time (seriously it takes like an hour with the game paused) handing out new territory and reorganizing my vassals as best I can. Oddr’s main goal now is to live as long as possible, given his illness, so that his youngest son Gorm will have the chance to grow up a bit. 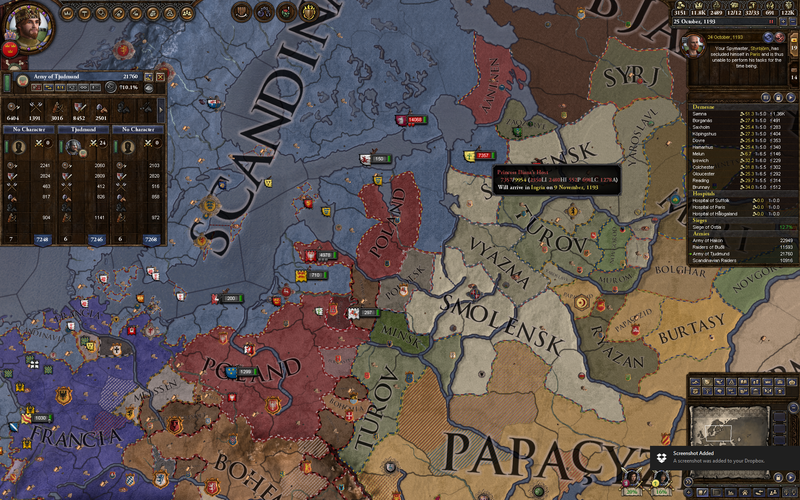 Almost immediately, my vassals start declaring wars against each other and everything else in sight. 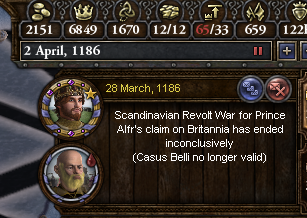 I have the “External Wars Only” law but I don’t think it works properly, since they still fight each other a lot. Oddr starts to gather his own forces for some raiding, but he’s quickly losing his grip. 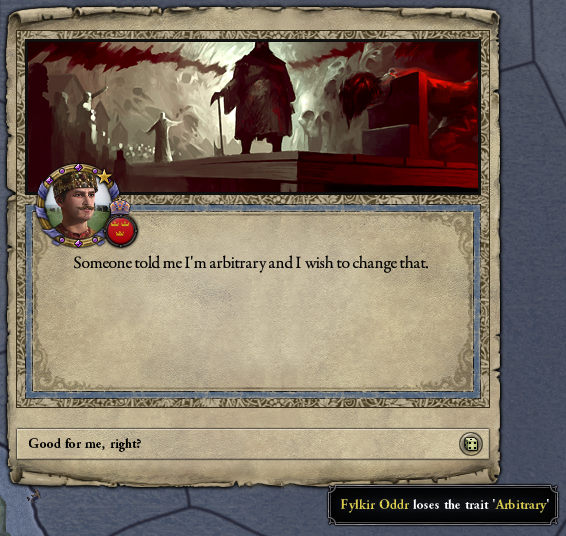 Sadly, Oddr dies less than a year after his greatest achievement, leaving me with an eight-year regency for his son Gorm. 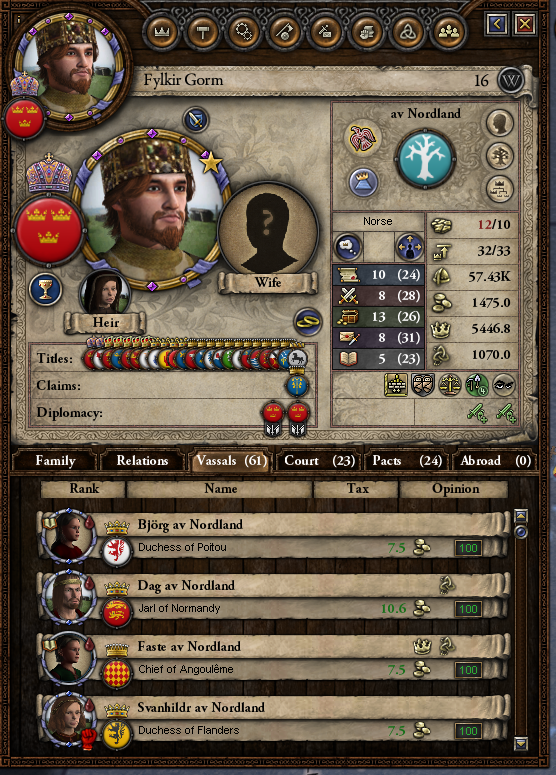 Gorm is looking reasonable, stats-wise, but his vassals are going to kick up a fuss. 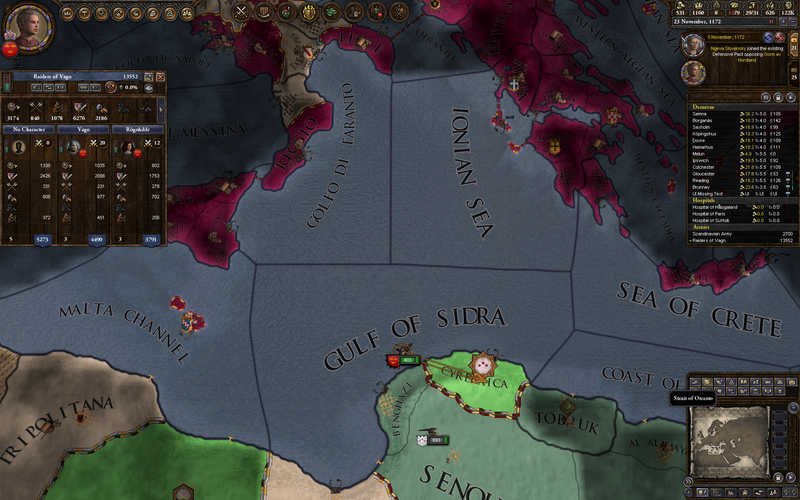 Following Dad’s example, he sends raiders to burn down Cyrenaica. This … feels like something out of a 90’s PSA, right? Ahhhh! 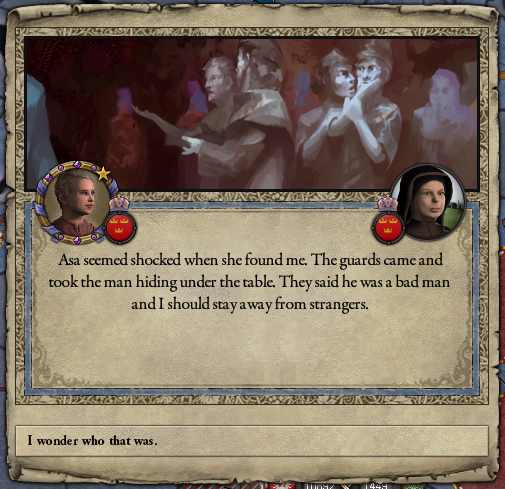 Stranger danger! Stranger danger! 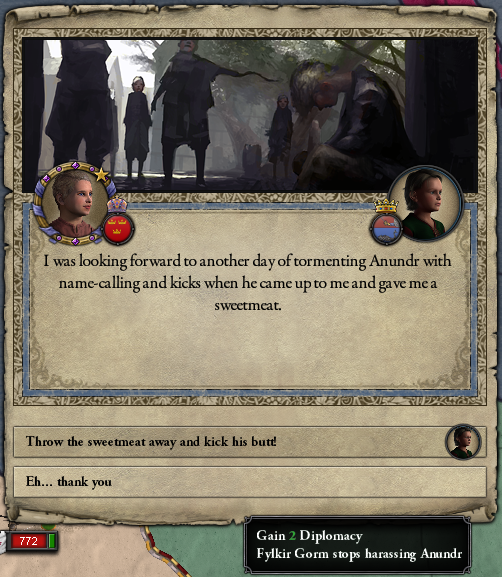 Learning to take bribes gracefully is an important skill for a young emperor. Venice still flammable? Just checking. 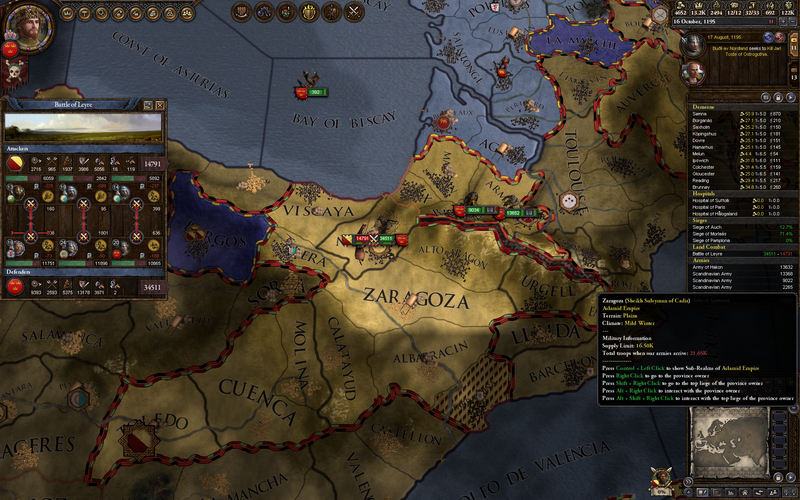 Very slowly, I’m reclaiming my land from the Catholic usurpers. Although they will not give up with the rebellions! Take a hint, guys. There’s a reason it’s the twentieth rebellion, and it’s not because the other nineteen went great. Good to have you on the team, Mom! Seriously great, because Mom is pretty awesome. However, she keeps trying to teach me about stupid Christians. 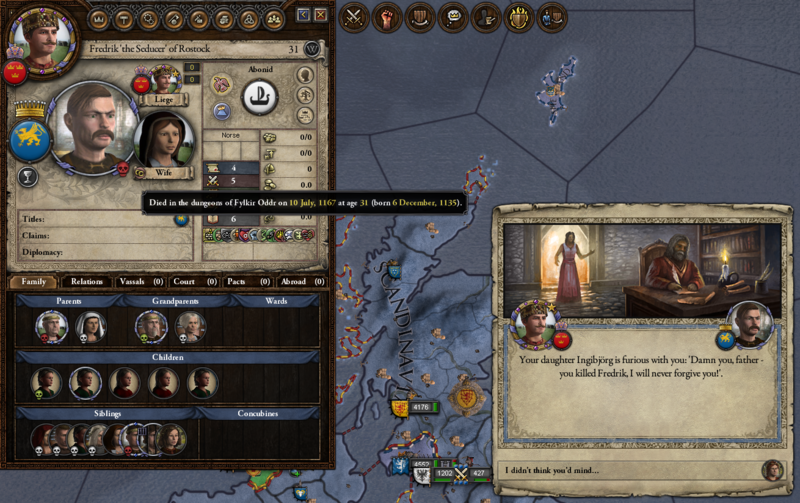 Her attempts to make me religious don’t stick, though. 14-year-old Gorm’s worst fear: the Catholics are revolting, using math. Gorm comes of age. 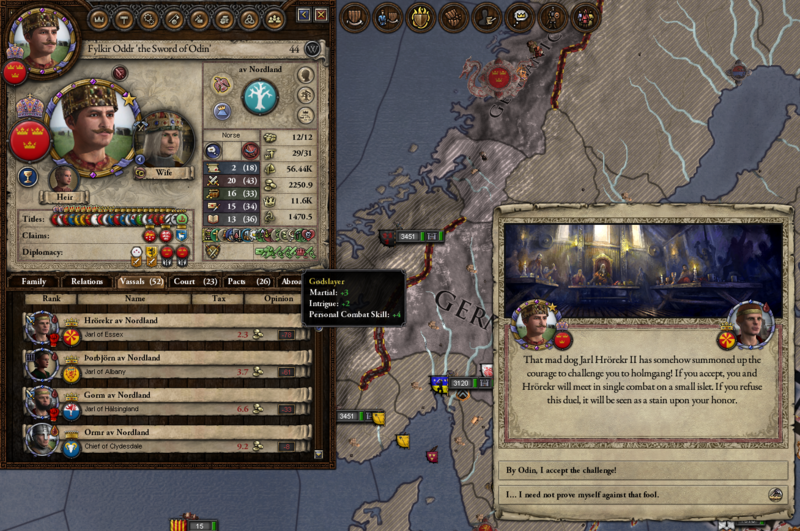 He’s just, diligent, and cynical, though his stewardship education didn’t go as well as I’d hoped. The best available spouse in the kingdom is my niece. Which, no. So we go shopping elsewhere. 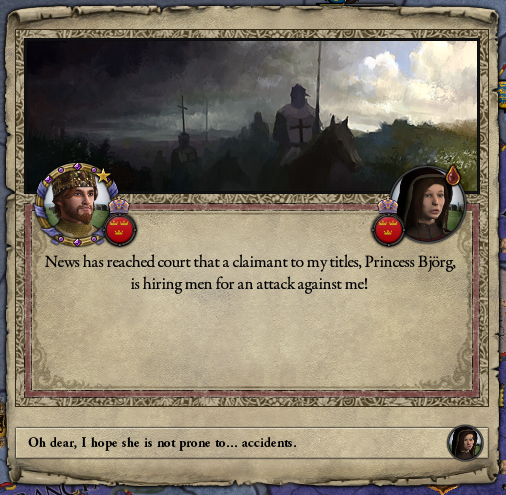 I invite Asa to my court, casual-like, and then spring the news that she’s marrying the Emperor before she has a chance to run for it. 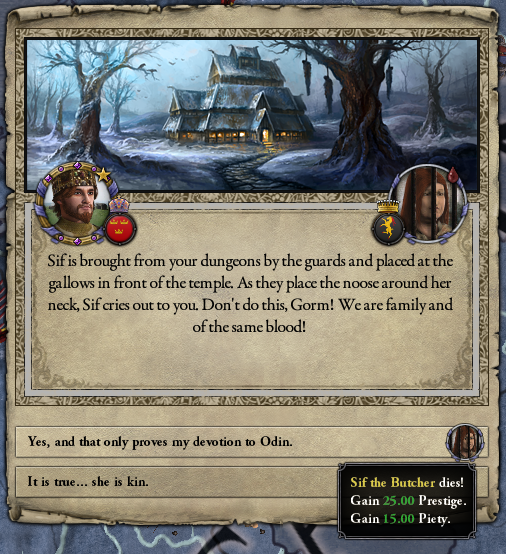 Duchess Sif the Butcher is trying to kill me, so we go to war to throw her in prison. Conveniently, I get the chance to hold a Great Blot shortly thereafter. 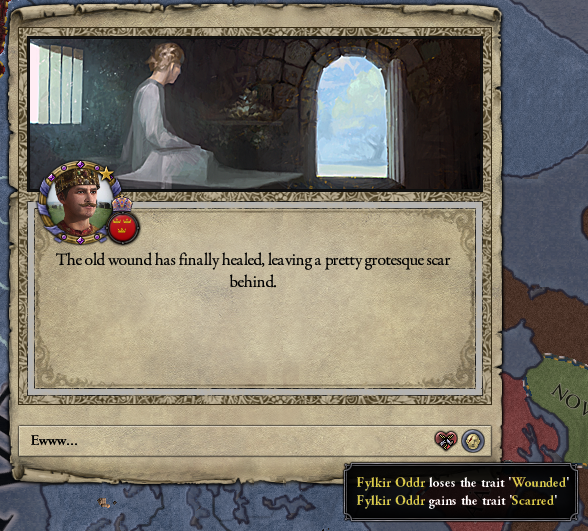 Praise Odin! 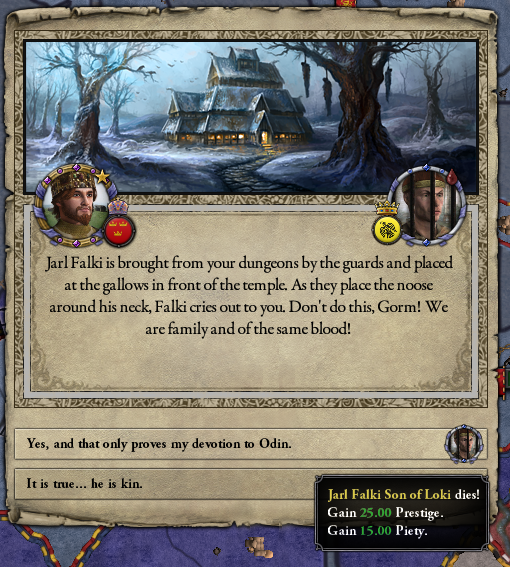 Falki Son of Loki is next. He absolutely hates me, for some reason. He rebels as well, but I get him in battle soon after. Convenient! 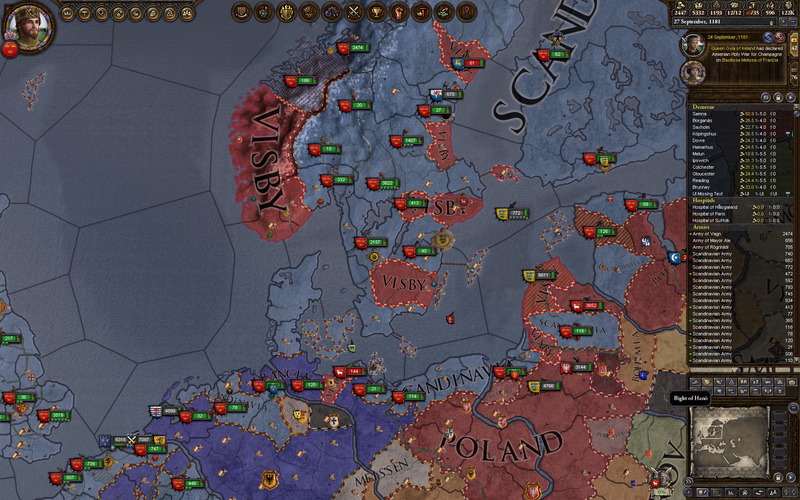 Shortly thereafter, though, Visby rises up in revolt. It never ends with these guys! Stockholm Syndrome is setting in. “Good luck with that.” Except. He’s my older brother. And he’s invading me. That may be taking politeness too far, Gorm. Visby goes to prison. 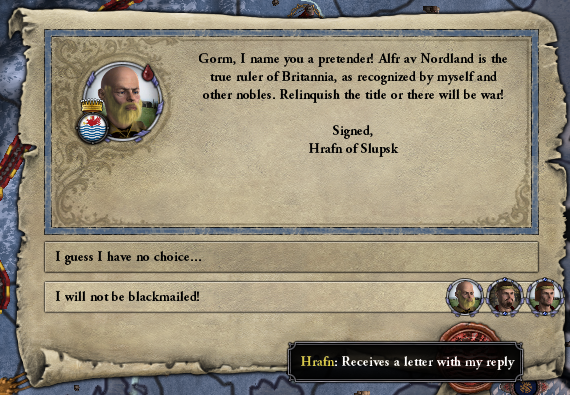 Inconveniently, my brother Alfr invades Scandinavia by way of Serbia, so I have to put the army on ships and go and fetch him. — so Alfr loses his head! Problem solved. 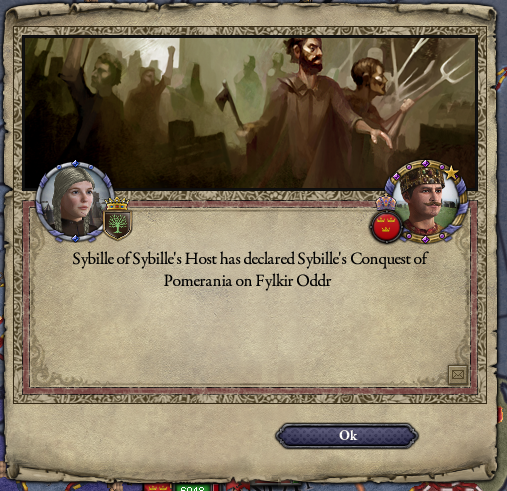 Of course, now I’m a tyrant and a kinslayer. Whine, whine, whine. 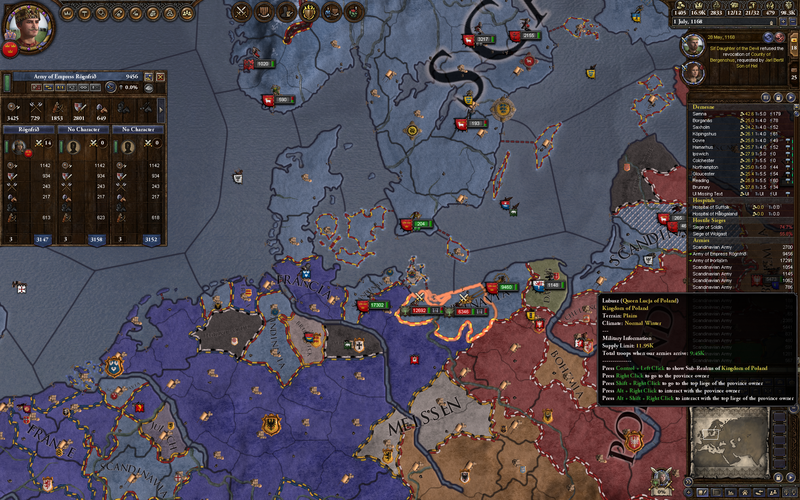 One of my vassals manages to retake Zeeland, a Germanic holy site, bringing all five back under my control. 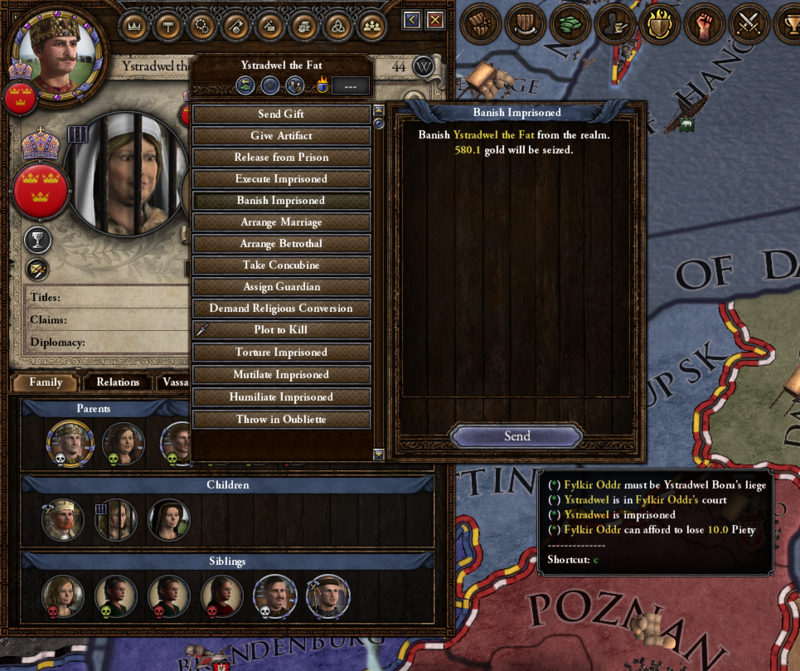 Good vassal! 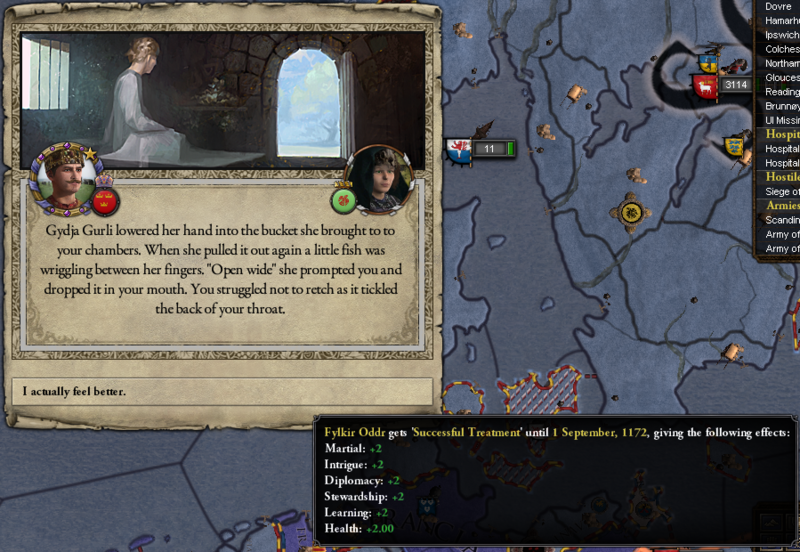 Have a vassal snack! 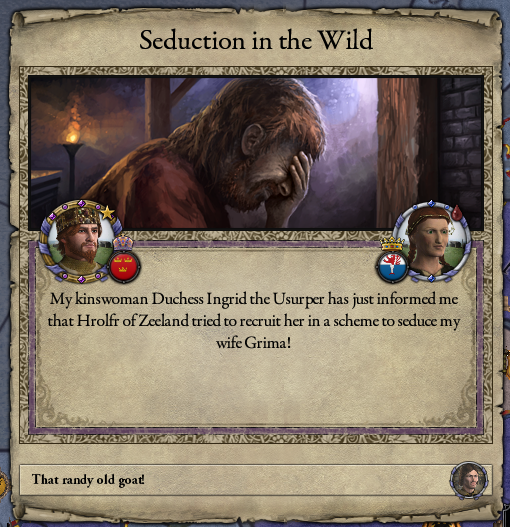 Seriously, now my sister is coming after me too? Learn from example. 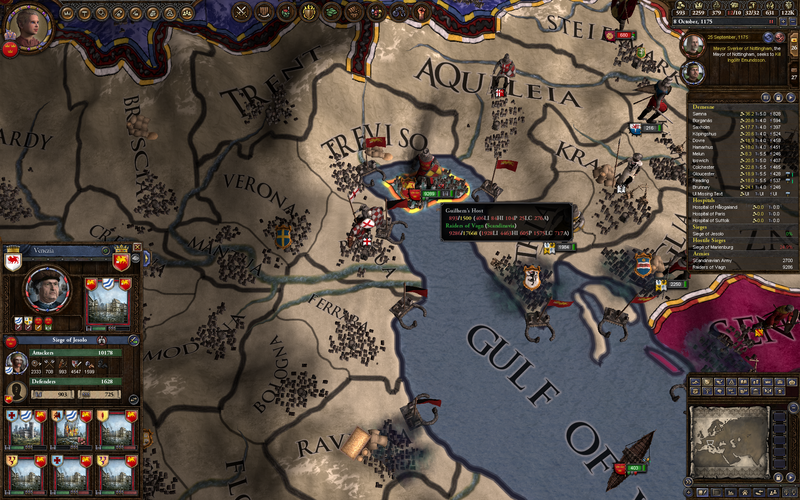 Another vassal takes over Venice. Which is … great, I guess. 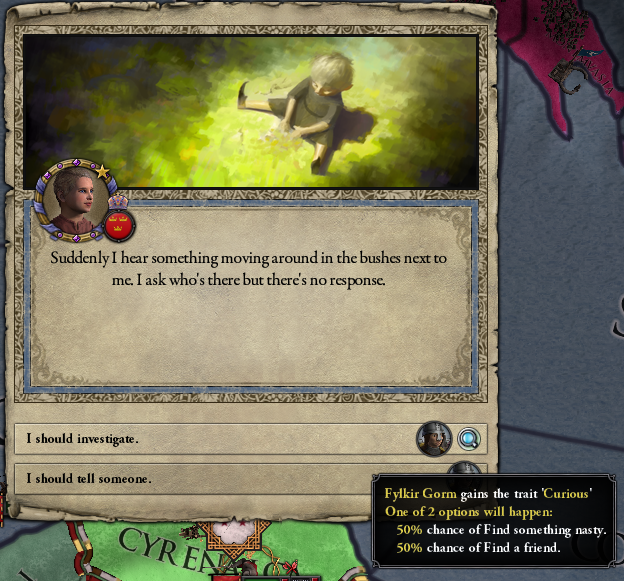 But now what will I set on fire? And now my niece wants in on the action. 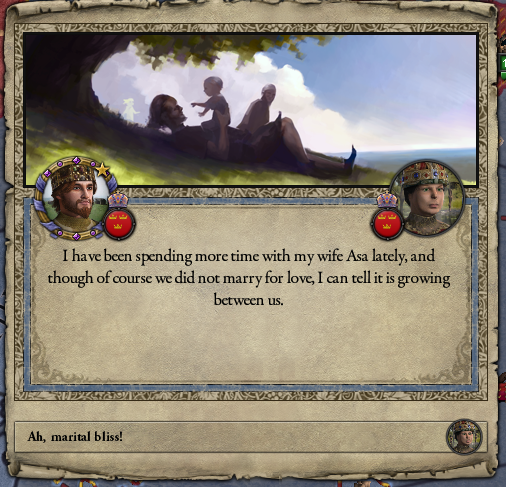 Is it because I wouldn’t marry you? Maybe think again about that haircut. 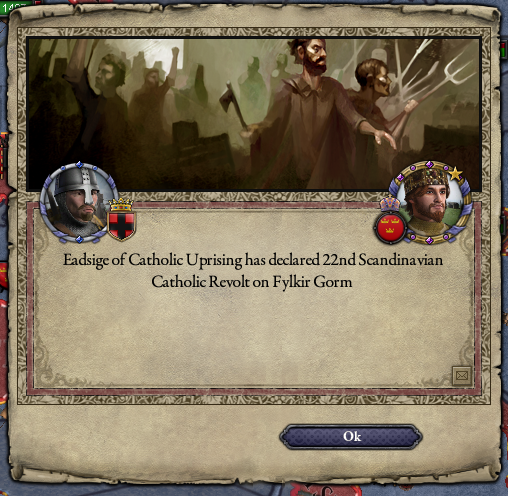 I revoke titles from some Catholic counts. Most of them agree, but this one is either really brave or really stupid. Honestly, man, at this point being of the same blood is kind of a strike against you. This family! With the threat from the Great Holy War finally expired, I grab Leinster off of France, just as Bjorg and Iliana show up with their armies. 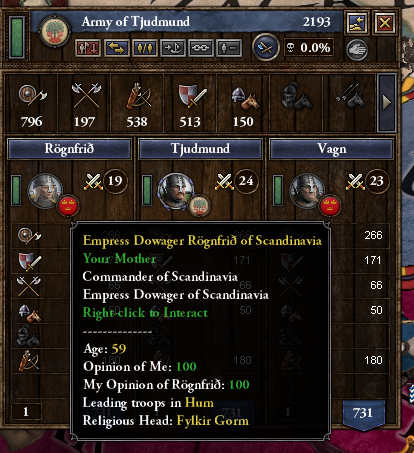 Mom is almost sixty, but she still leads a host of bloodthirsty Vikings with the best of them. I’m briefly confused that there’s both Princess Bjorg and Prince Bjorn in the mix. 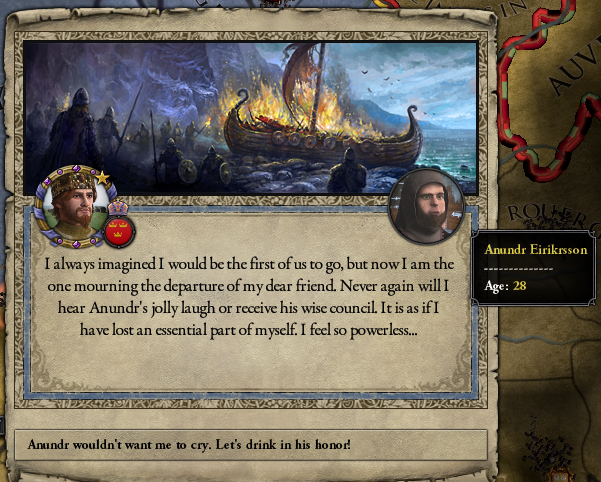 Bjorn is unrelated, though, and he’s not at war with me, just looking to burn a few things down. I can respect that. 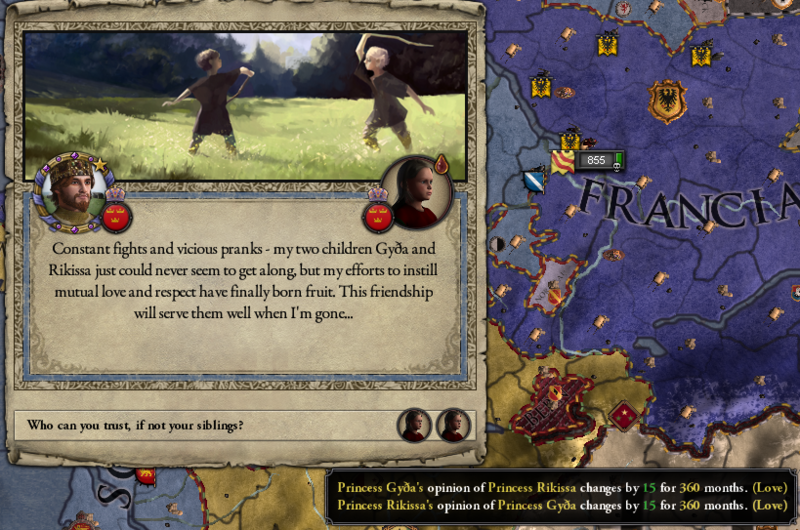 “Who can you trust, if not your siblings?” Gorm thinks, as his own siblings declare war on him one after the other. 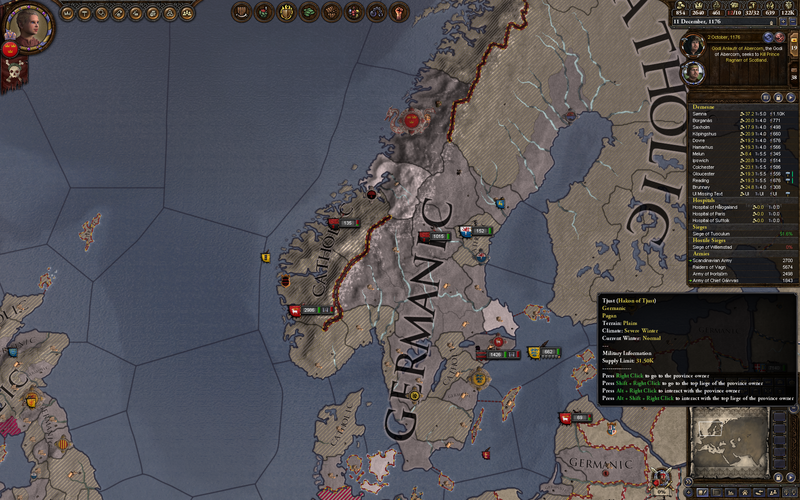 For the longest time these invasion forces don’t even show up. I sit around with my troops in the middle of the ocean, waiting. Come on, girls! Time is money! 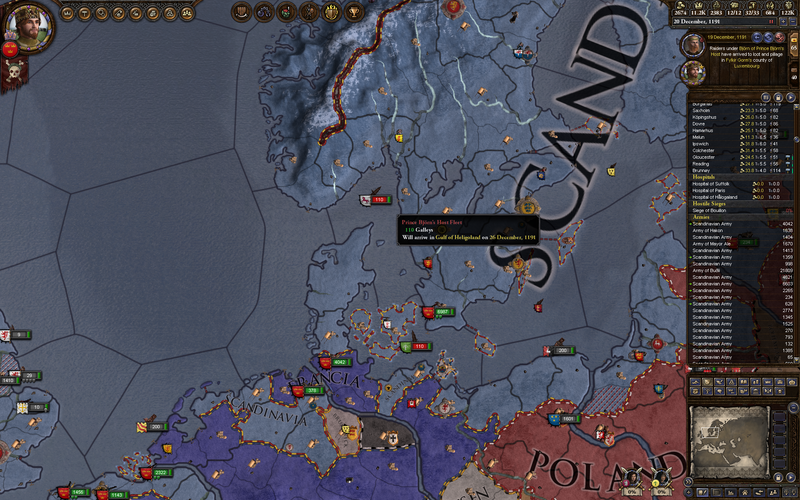 Eventually I find them way over in Finland, already freezing to death. 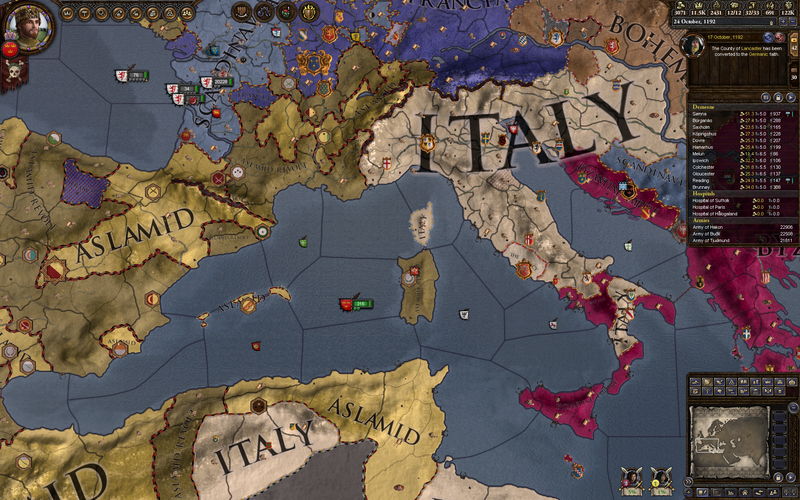 Pro tip: if you’re going to invade somewhere, might as well invade somewhere warm with nice beaches. 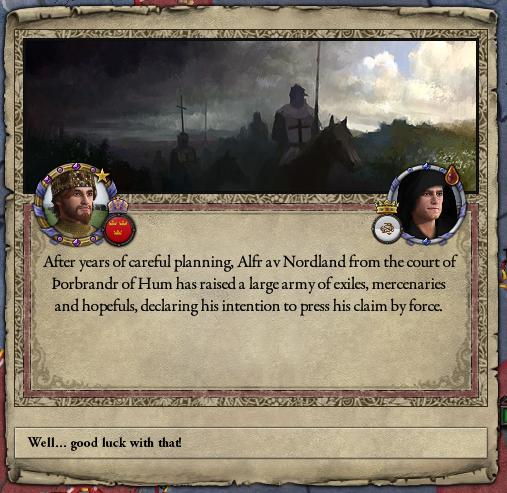 Once I’ve tracked them down, smashing their armies doesn’t take long, and soon they’re banished and their funds line my warchest. With that finally wrapped up, I have a good chance to take some land off the Aslamids. They’re having a civil war at the moment, so the time is ripe. 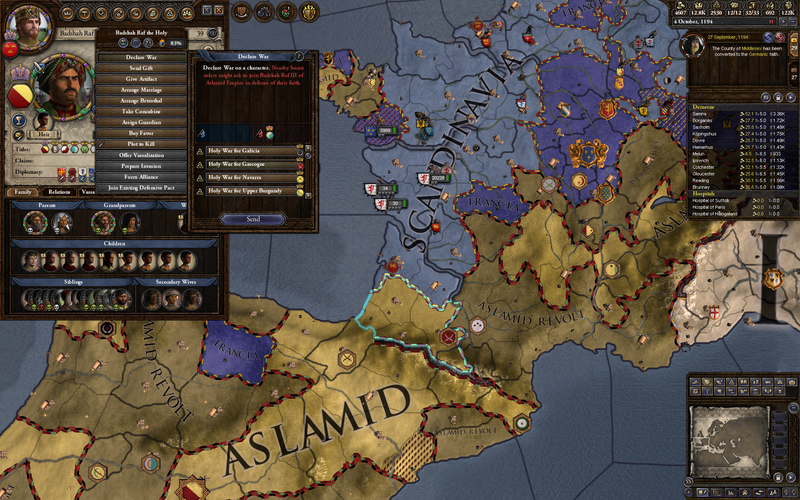 A quick holy war will bring in only other Sunnis as allies, and there aren’t many of those in the vicinity. So here we go! Wait. Say that again, more slowly? Gorm’s best friend dies young, and he takes it pretty hard. 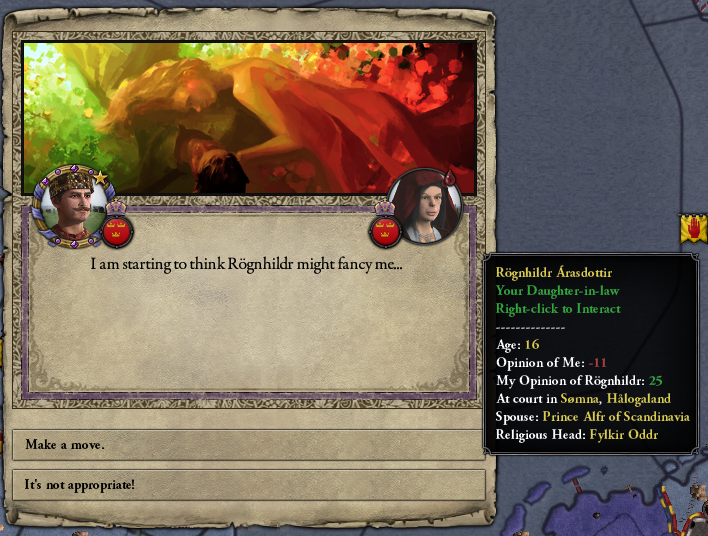 That may be taking it a bit far. 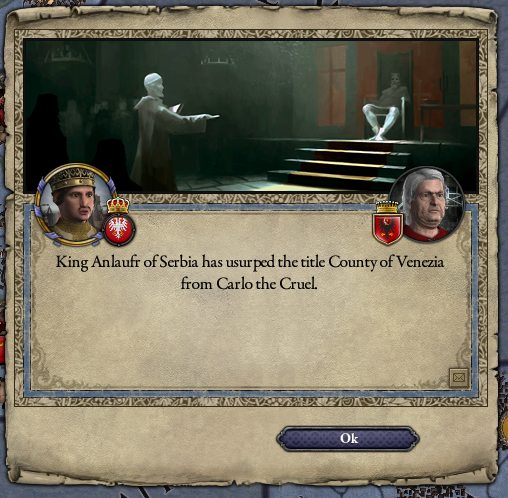 He wasn’t that great. 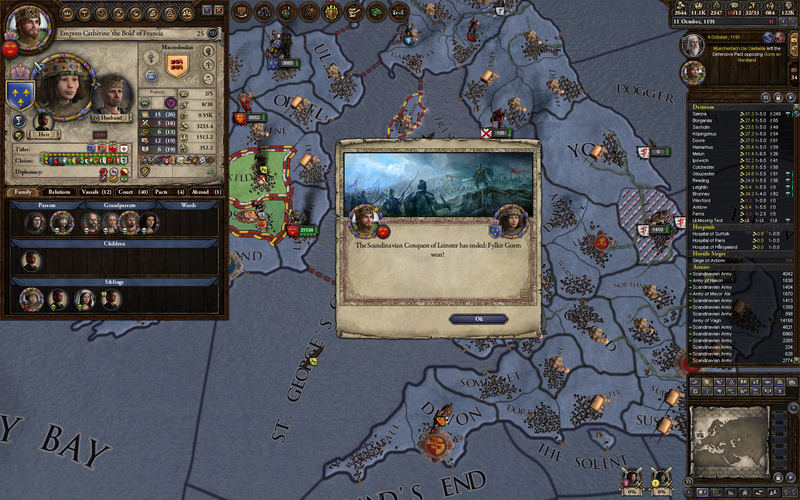 Meanwhile, my armies bring the Aslamids to battle while we besiege their castles. 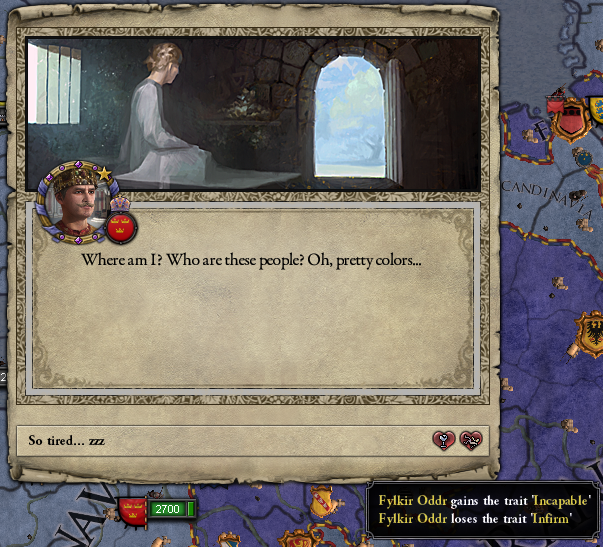 I also get the chance to usurp the Kingdom of France! 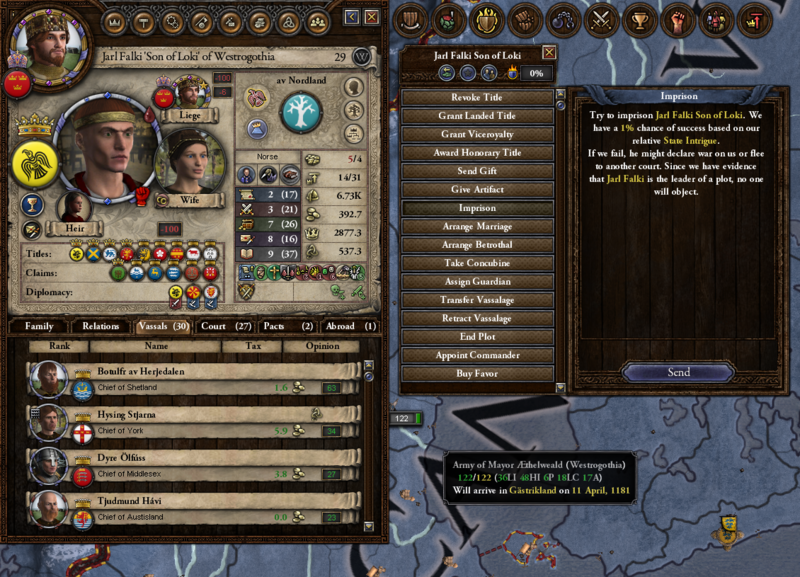 See, the title was held by the Emperor of Francia, and while I controlled all the territory you can’t usurp a title from someone who is at war. 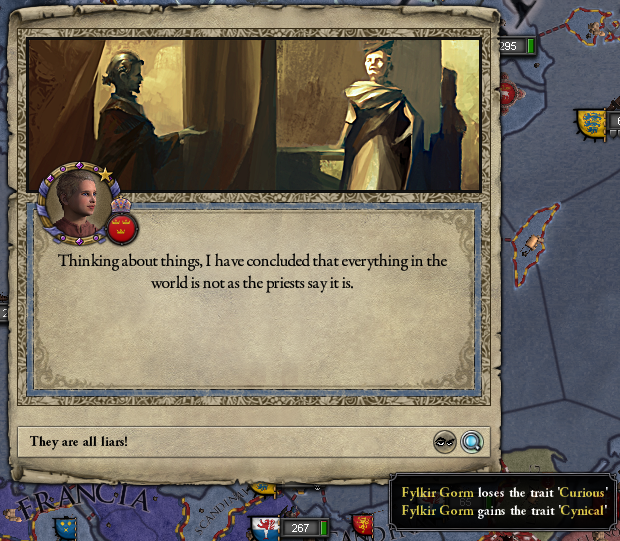 Which, until now, has been always true for Francia. But they’ve attained a brief piece, so I can deliver my official notice of usurpation. And Gascogne is mine, too! 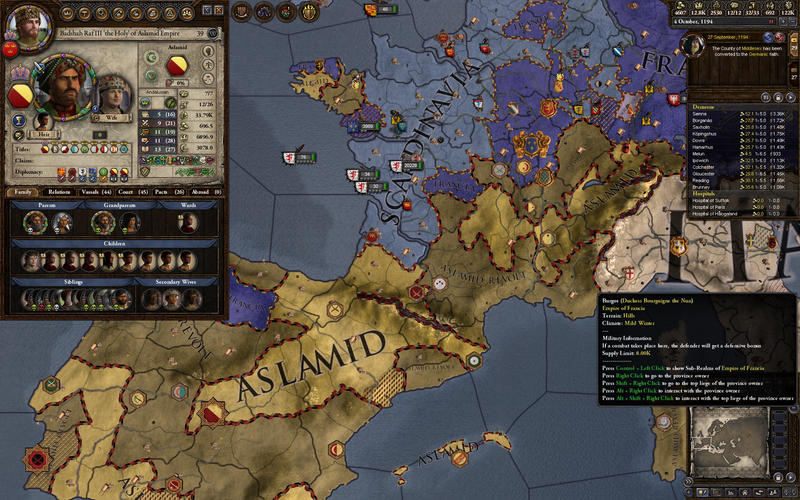 I spend a bit more time re-organizing my vassals in France. 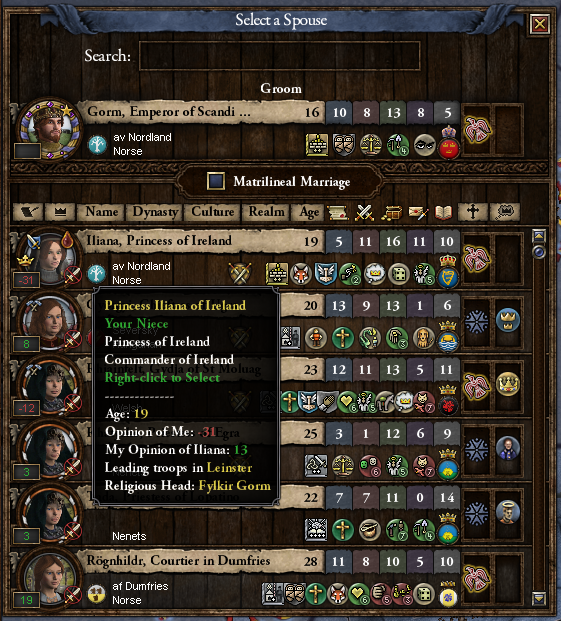 A bit later, as I wait for my threat to subside, my vassals subdue the last of the Irish. 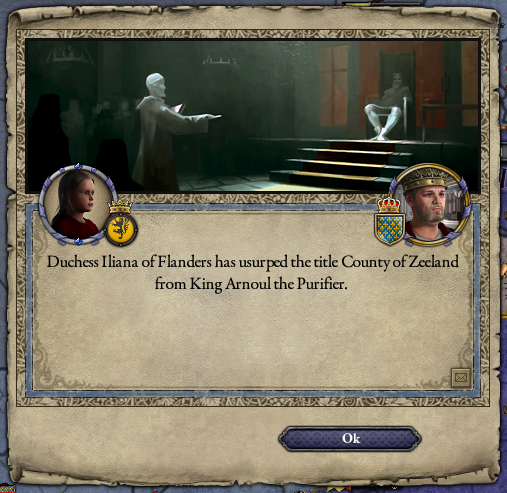 I’m now served mostly by kings, rather than dukes. 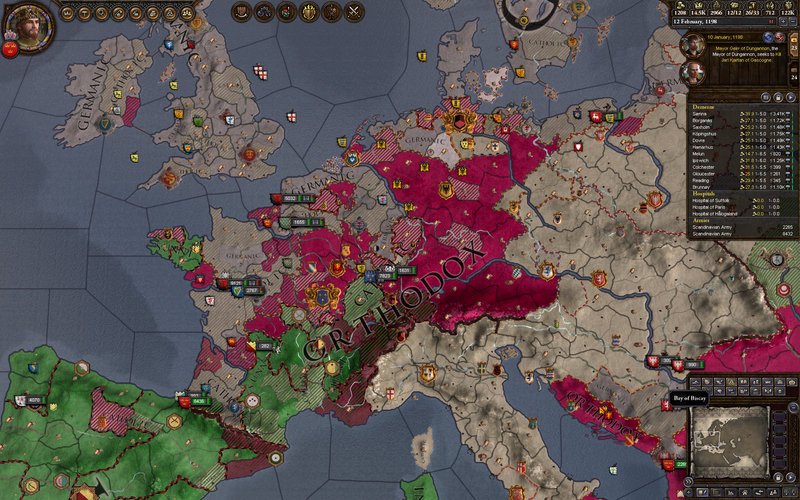 I’ve created England, Wales, Scotland, and Ireland, and now France, consolidating the duchies underneath them. 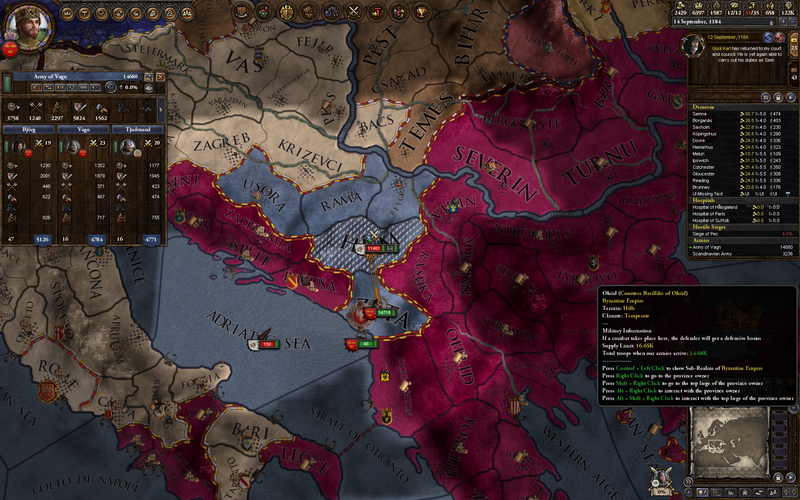 This creates powerful vassals, but it can’t be helped, since I need to stay under my vassal limit. 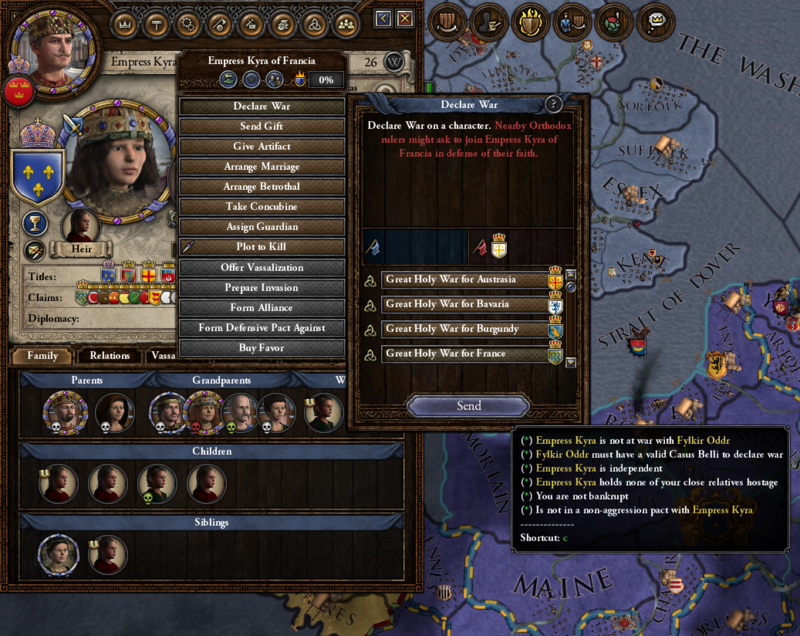 I’ve been trying to redistribute titles in such a way that each kingdom and duchy has the vassals it “should”, since this limits jealousy, but the vassals are always conspiring to ruin my neat arrangements by fighting and/or marrying one another. 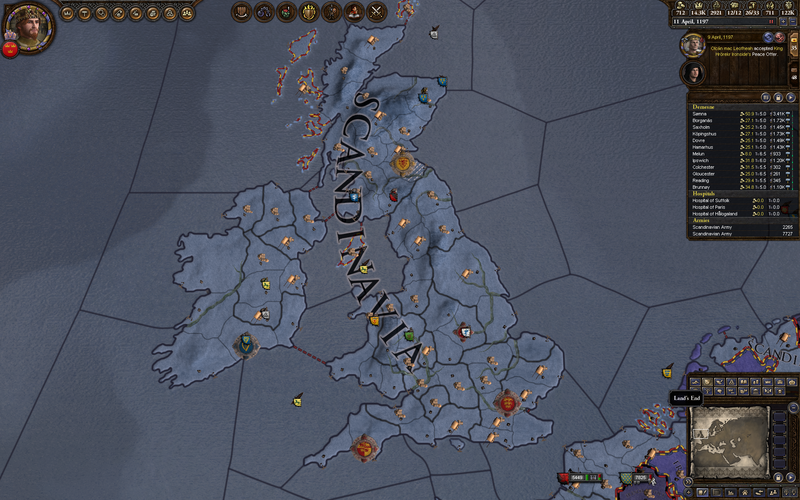 Much of England and Ireland now follows Odin once again. 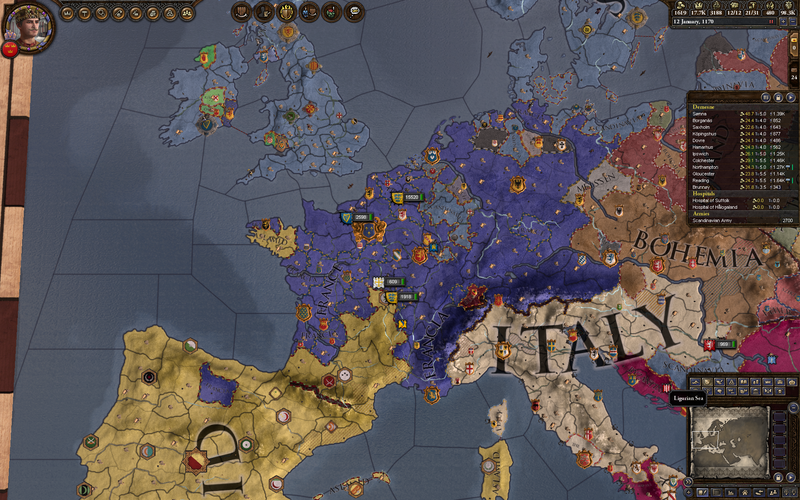 France is just a mess of Catholic, Germanic, Orthodox, and Sunni all mixed together. At 34, Gorm is looking pretty darn competent! 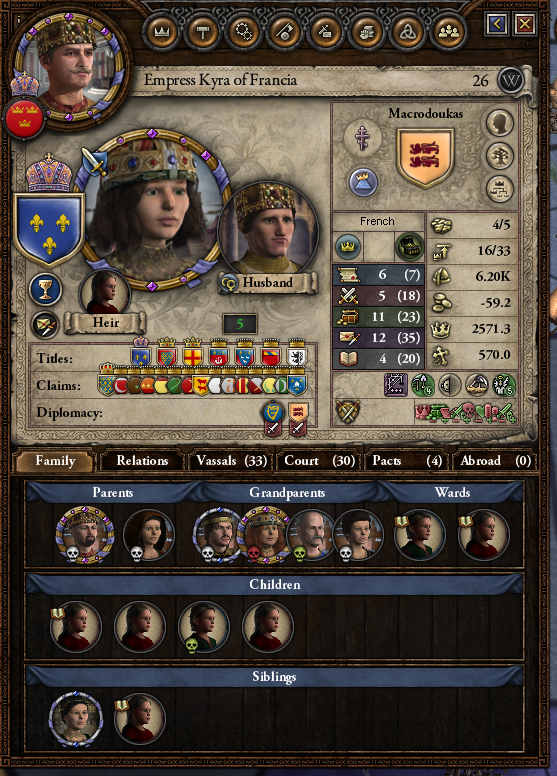 He’s also managed to have six children. 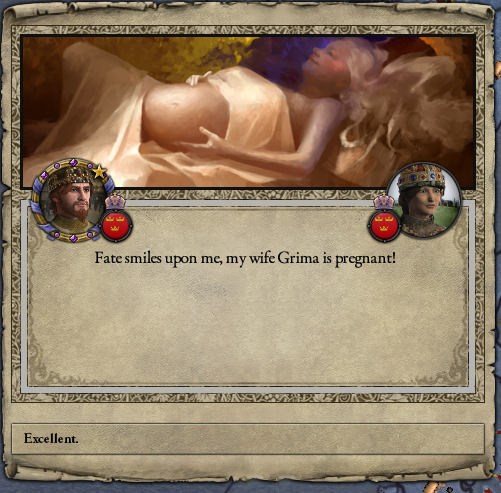 Grima, his wife, is also quite awesome. Seriously, you two. 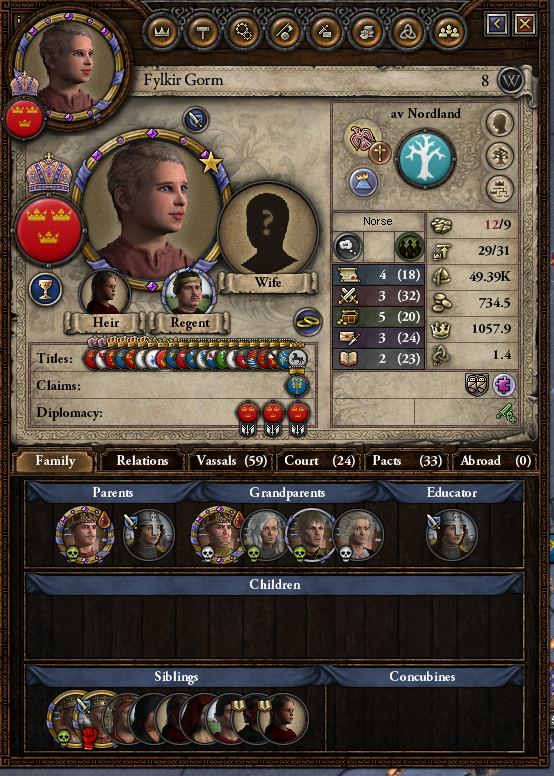 That is enough kids. I have also had about enough of these. 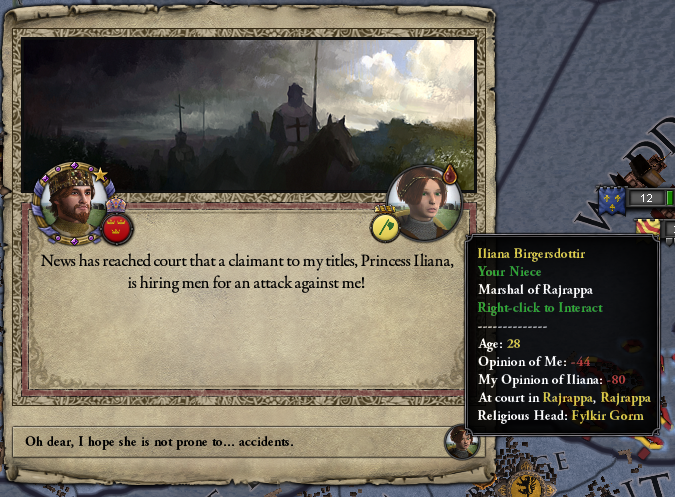 Current Year: 1199 AD. Current Status: King of the French. Another fun read as always! 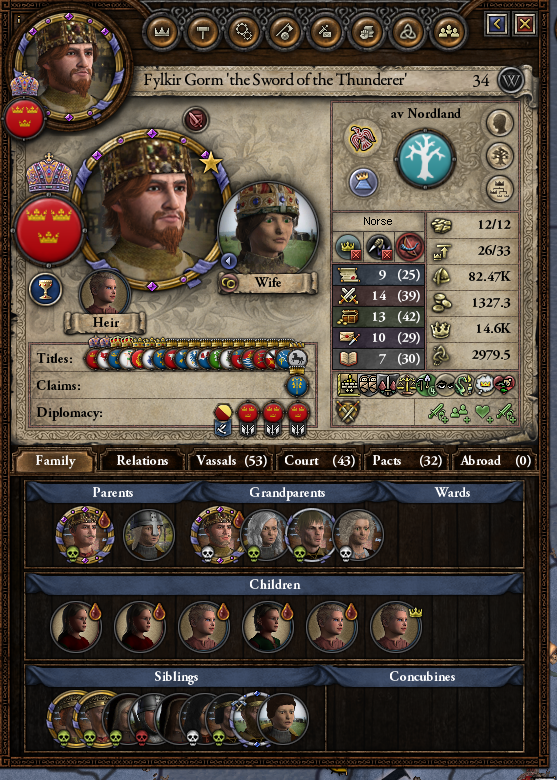 Every time I see one of these it makes me want to play CK2. 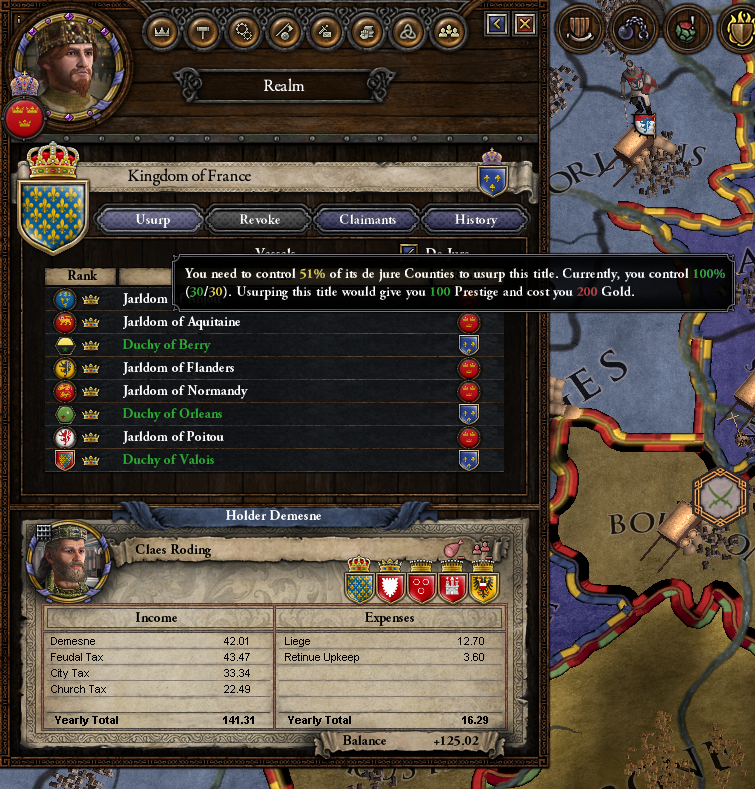 Congrats on becoming King of the French, and defeating the most feared of all enemies: Math.